Most ecological surveys are concerned with not just one species or the total number of individuals (although some are!). Instead, there is a larger focus on the entire community, and how individuals are distributed among each species within that community. This kind of sampling can be challenging and it’s difficult to tell beforehand exactly how many samples ought to be taken. A pilot study can give you some qualitative insight, but there are rarely hard and fast numbers. Consequently, we err on the side of oversampling. In other words, if you’re interested in conducting, say, an NMDS, how many samples will need to be taken before you’ve essentially captured the community structure? After what points do more samples become redundant? The multSE actually based on the age-old idea of sums-of-squares (SS). Unlike an ANOVA, where SS are calculated as the summed squared difference between each point and the overall mean, the multSE is concerned with the summed squared distance between each point in multivariate community space and the centroid (essentially the mean of multivariate space). Actually fairly straightforward, and not any more complicated than doing a simple ANOVA. The hardest part, of course, is getting the multivariate distance, which can be obtained from a dissimilarity matrix — for instance, based on Bray-Curtis distances. So how does this tell us about precision? Well, as more samples are added, they presumably add some degree of similar information about the community. Thus, as the number of samples increases, there exist more and more points closer to that centroid (which will also shift depending on the configuration of points in multivariate space). In terms of the equation above, then, we find with increased sampling the average distance between each point and the centroid gets smaller and smaller. Eventually, new samples will not change the position of the majority of points in that space, or the centroid. After that point, there is no further minimization in multivariate error. In other words, we have discovered the number of samples after which continued sampling will fail to yield any significant improvement in precision. To derive errors for estimates of multSE — so we can actually test for significant changes in precision as a function of sample size — we can use what Anderson & Santara-Garcon call a ‘double resampling method.’ Without going into too much detail, this involves permutations over some number of iterations — say 10,000 — to arrive at a mean for each sample size, and bootstrapping to derive 95% confidence intervals around these means. This allows us to test whether precision significantly changes from one sample size to another by determining whether the confidence intervals overlap. I should note that it was brought to my attention in the comments that the use of sums-of-squares to investigate community variances is not a novel idea, and was presented nearly twenty years ago in the literature by Pillar and Orlóci (see references below). In fact, Anderson herself proposed that it can be used to approximate multivariate dispersion some 10 years ago, and thus can be used to test homogeneity of variance among groups in multivariate space (see here, and the betadisper function in the vegan package). That minimizing sums-of-squared distances had endured beyond simple ANOVA well into the 21st century and the wide adoption of multivariate techniques to address complex community structures is a testament to its utility and interpretability. So, how does one interpret the output from these equations? To begin, let’s use an example. I’ll draw on some fish survey data from Poor Knight’s Island and included as a supplement to the article above. 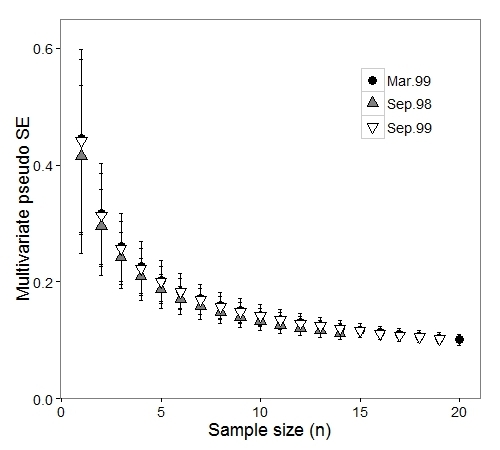 Briefly, the data were collected using visual census along a 25 x 5 m transect at a depth of 8-20 m. Three time periods were sampled: September 1998 (n = 15), March 1999 (n = 21), and September 1999 (n = 20). Naturally, we’ll be using an R function to perform the calculations. I actually re-wrote the function included with the supplements (MSEgroup.d) to make it more efficient. The new function is called multSE and allows the analysis to be parsed by multiple groups — in this case, sampling periods, but it could just as easily be different sites, treatments, etc. The latest versions of these functions can be found at my GitHub repository: https://github.com/jslefche/multSE. The first column represents the sample number, the second the sampling period, followed by abundance data for 47 species observed on the surveys. The output gives the group (sampling period), the number of bootstrapped samples (1, 2, …, n) and the mean pseudo-variance. These are followed by columns for the lower and upper 95% confidence intervals based on 10,000 bootstrapped / permuted values (the default). This plot is analogous to Figure 2b in the Anderson & Santana-Garcon paper (although they have removed a few points along the beginning of the x-axis). 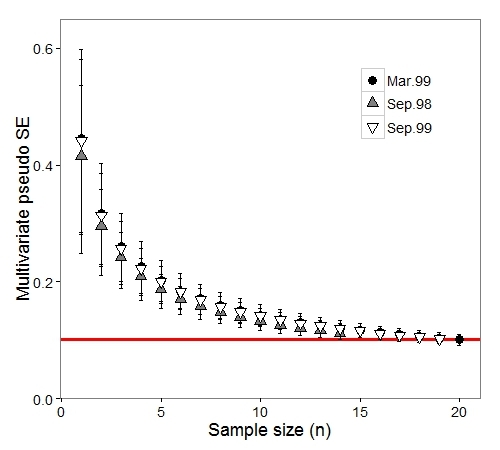 As expected, mean error decreases (and precision increases) as more samples are taken. The errors around those means also decrease with more samples. But the multivariate standard error starts to level out around n = 10 samples. It is immediately clear that one can take only n = 14 samples and not see a significant decline in precision: This is a one-third reduction in effort! That means less SCUBA, less boat time, fewer personnel. Significant savings! Which is analogous to Figure 3 in the Anderson and Santana-Garcon paper. 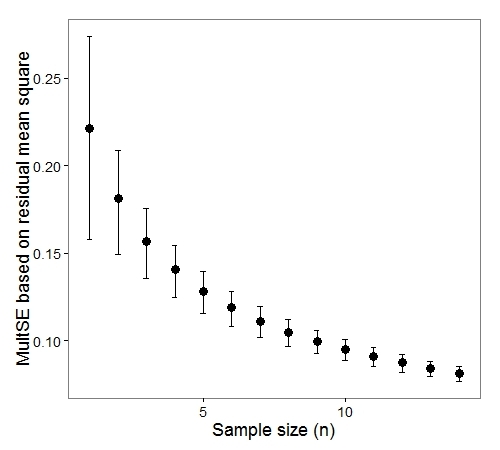 In this case, we can estimate the change in precision with an increasing number of samples across all sampling periods, and come to much the same conclusion: there is no significant gain in precision after n = 14 samples. As pointed out in the paper, this is useful in designing studies to optimize sampling effort. This can be done by running a pilot survey, sorting a bunch of samples, and calculating multSE, then going back and collecting only enough samples to satisfying the minimum level of precision identified during the pilot. Of course, the danger here is that the community does not change between when the pilot was conducted, and when the actual surveying occurs. Anderson and Santana-Garcon also point out that there is no universal threshold for multSE — it depends only on the communities studied during the time and area at which the samples were taken. So it isn’t useful to extrapolate inferences from one survey at one time and place to another survey at another time and place. I actually came at this from a slightly different perspective. I’ve been working up some long-term survey data, and earlier sampling dates had fewer surveys. 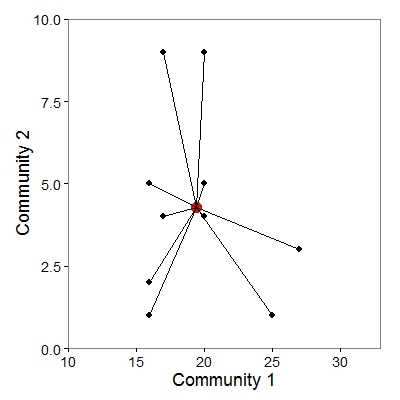 I wanted to understand if this might be a problem — if those communities could have been undersampled relative to the later sampling dates in terms of defining community structure. Either way, this stands to be a powerful tool for understanding how to allocate sampling effort in ecological surveys. Anderson, MJ and J Santanta-Garcon. 2015. “Measures of precision for dissimilarity-based multivariate analysis of ecological communities.” Ecology Letters 18(1): 66-73. Orlóci, L. & Pillar, V.D. 1989. “On sample size optimality in ecosystem survey.” Biometrie Praximetrie 29: 173-184. Pillar, V.D. & Orlóci, L. 1996. “On randomization testing in vegetation science: multifactor comparisons of relevé groups.” Journal of Vegetation Science 7: 585-592. Science progress is often characterized by rediscoveries, but sometimes previous knowledge is not clearly recognized. What is indeed novel in this paper by Marti Anderson and Julia Santana-Garcon is the use, as objective function for sampling sufficiency assessment, of the standard deviation (MultSE) derived from the total sum of squares computed on pairwise distances. However, surveys usually aim at analyses that go beyond the analysis of variance alone, such as a classification of the sampling units, their ordination in a smaller number of dimensions, or the evaluation of correlation between biotic composition and environmental variables, for which more specific functions, such as the ones described in the above mentioned references, could be more useful. Sufficiency in sample size depends on the objective of the analysis. Quite right! Credit where credit is due. I appreciate you reaching out as I was not aware of these publications (there is . I have amended the blogpost to reflect this and also added your references to the end of the post. Really useful article, thanks Jon! When running the code multSE, group is not retained in the “output”. I.e. 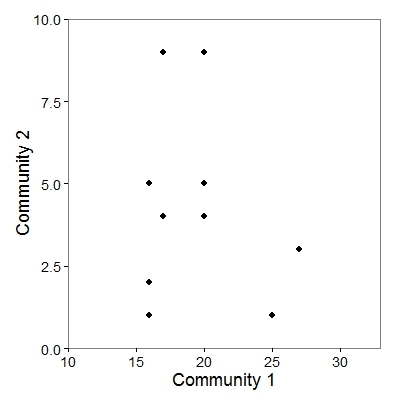 there is only a single metric per n (not for each group) when plotting multivariate pseudo SE. I am sure I must have missed something, but would be grateful if you could assist or clarify. I am using PERMANOVA to analyse fish assemblages samples observed using Baited Remote Underwater Video systems. I would like to know if the fish assemblages were different between various habitat types, including, seagrass, sand, coral, rubble, and epilithic algal matrix. My sampling design was unbalanced, such that I have many samples in coral and rubble habitat, and few (probably too few) in other habitat types. It appears the precision rapidly drops when there were fewer than 6 samples in a habitat type from the from the Multivariate SE based on residual mean square. I therefore may need more samples, or drop samples from undersampled habitat from the analysis. Many thanks again for this super useful bit of code!